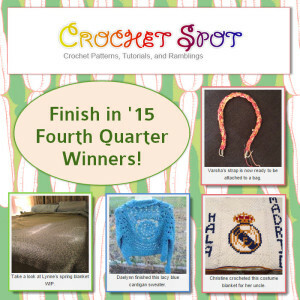 Two-thousand and fifteen was a productive year for the Crochet Spot community and you’ve all earned the reward of a job well done on your crochet projects! 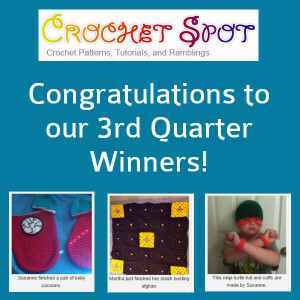 December 31, 2015 marked the end of our Finish in ’15 Contest, and we’re excited to announce the final winners! I’m really excited about this book because it explores a concept I have been thinking about for a long time. 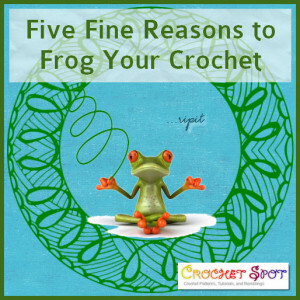 It also encourages creativity in the crocheter. That is a great combination, but we can’t expect anything less from legendary crochet designer Margaret Hubert. 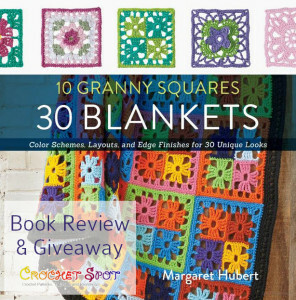 Today we learn a little more about the new book 10 Granny Squares 30 Blankets by Margaret Hubert and you’ll see how you can win a copy! It is hard to believe that the third quarter of 2015 has flown by, but it has! We are happy to announce the winners of this quarter’s Finish in ’15 WIP/UFO contest! Don’t forget there is still the fourth quarter of the contest remaining, so all entries submitted since the first quarter are still valid to win if you haven’t already. Finish in ’15 New Prize! Handmade Shawl Pin from Michelle’s Assortment! Hey, everyone!! 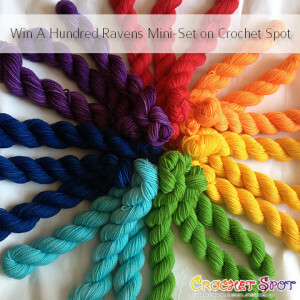 During my recent visit to Stitches Midwest I was on the lookout for things I thought you all would love and even some prizes to pass along to the readers of Crochet Spot. 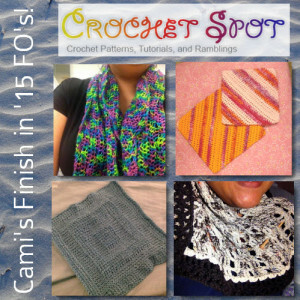 Since we’ve been engaging in our Finish in ’15 WIP/UFO Challenge all year, I was hoping to sweeten the pot with some unique & crochet friendly swag. 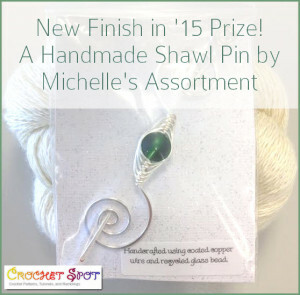 Luckily I found an intriguing option, a handmade shawl pin from Michelle’s Assortment! This is the actual prize! Green goes with everything! Hooray! We have three lucky winners of the prizes in our Finish in ’15 Challenge! Heeeeyyyyy! Remember how we started this cool contest all about finishing our WIPs and UFOs in 2015? Remember, it wasn’t a resolution, it was a CHALLENGE! And like all good challenges, there are rewards. And guess what? The rewards get better as we go along! 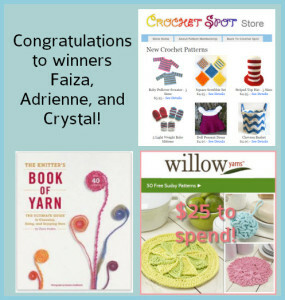 Read on, ’cause this is BIG & involves FREE YARN! Hey, guess what! We have a winner of the first prize in our Finish in ’15 Challenge! 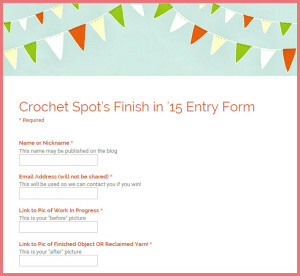 Crochet Spotter Crystal Wall entered the contest and was chosen at random to receive a free pattern from the Crochet Spot Store! Here are Crystal’s WIP pictures! 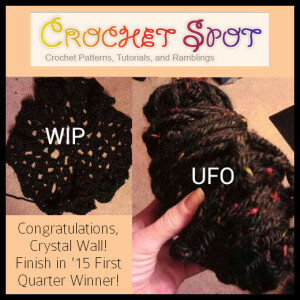 Finish in ’15 Crochet WIP/UFO Contest Update! Hello, hello! You may remember these little details from my original Finish in ’15 contest post. And happy happiness, we’ve already got some entries right there on the thread. Since this will be an ongoing thing, Rachel and I have decided to introduce a quick and easy entry form. It’s really easy to use and has only four fields. You can see what it looks like in the picture below. To fill out the form, all you need to do is click on this link, which will redirect you to a google form. In case you want to share it, the web address of the link is http://goo.gl/forms/ijoLLXiokp.